WASHINGTON — The U.S. Navy’s ongoing aviation readiness crisis has been a boon for Boeing as the service looks to make its Super Hornet fleet healthy again after years of hard use in the war on terrorism. Boeing’s Super Hornets are helping push sales of its defense operations business in a positive direction, contributing to a more than 10 percent year-to-date sales growth, according to analysts and company executives speaking on a quarterly earnings call this week. A total of 46 new Super Hornets — 18 for the U.S. Navy and 28 for Kuwait — are leading the way, but the company is also making a lot of money on the Navy’s quest to modernize and extend the life of its workhorse jets. All told, the Navy is planning to modernize all its current jets and buy dozens more in its quest to dig out of a severe readiness hole. Boeing’s defense unit has seen an 11 percent year-over-year sales boost so far this year, said defense analyst Jim McAleese. And company executives have said the cash flow from the Navy’s F/A-18 recapitalization isn’t slackening anytime soon. “Boeing continues to see strong support for our key products in fiscal year 2019 President’s budget and in Congress, including increased procurement of 110 F-18 Super Hornets across the future year defense plan and support for a fourth multiyear procurement for the F-18, and increases for various programs in our weapons and rotorcraft portfolios,” Boeing top executive Dennis Muilenburg said in the July 25 call. While the surface fleet’s problems became national news and international news, aviation was instead in a kind of quiet crisis: still able to put working jets and trained pilots on carriers all over the world but eroding badly everywhere else. The effort is also leading to big dollars for parts and depot-level repairs, meaning repairs that are done at maintenance depots because the complexity surpasses what maintainers in the fleet can do on the flight line. In May, the Defense Logistics Agency awarded a five-year, $427 million contract for Super Hornet parts and spares to begin working through a backlog of down jets. 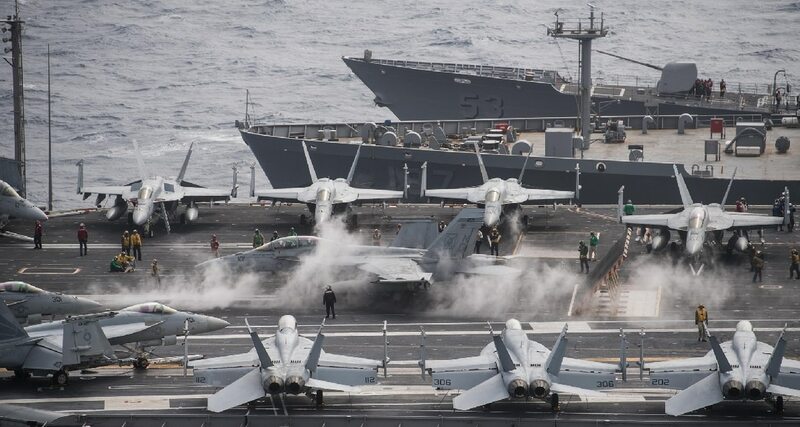 The quarter also saw the induction of the first Super Hornet into a service life extension program that will eventually see Boeing working on 40 to 50 F/A-18s per year in its facilities in St. Louis, Missouri, and San Antonio, Texas, USNI News reported in May. The Navy is working through a major backlog for jets, even going so far as to slash scores of legacy fighters from the rolls in order to clear out room in the depots for the more modern, serviceable fighters. In November, the former head of naval aviation, Vice Adm. Mike Shoemaker, told lawmakers that nearly 1 in 3 Super Hornets were not ready to fly. “We are meeting the combatant commanders’ requirements for ready, lethal carriers and air wings forward, but at a tremendous cost to the readiness of our forces at home,” Shoemaker told the House Armed Services Committee’s Readiness Subcommittee. The Navy is banking on the major parts plus-up and the recapitalization program to start to dig out of the readiness hole.